Play-Asia.com now have Doki doki Majo Shinpan! 2 DUO [First Print Limited Edition Box] at the reduced prise of US$ 59.90. Normal price is US$ 95.00. This is a limited offer, but it doesn’t say when it’s over. 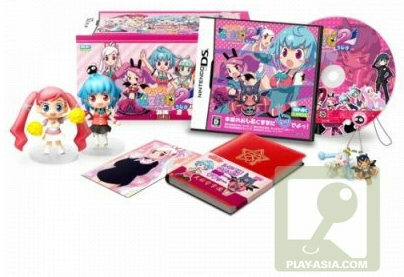 This installment in the hit Dokidoki Majo Shinpan series takes place weeks after the first game. Nishimura Akuji, a normal third year middle school student is summoned once again by the angels to start another witch hunt. This time the hunt takes him to a far away town called Yon Town. To carry out his mission, he masqueraded as a student in a school said to have been set up by witches. However, since his academic scores are bad, he ended up in second year instead of third year. To add insult to his injured pride, he is paired up with a converted demon, Kuro. Because of Kuro’s clumsiness, Akuji’s cover is blown. When his neighbor Seika Koron, another clumsy girl, finds out about his mission, she is determined to help him out. Witches, angels, demons and girls, Akuji’s in for an interesting middle school life. The game is split in an adventure part and a magic battle part. Search for items, gather information about suspected witches and chase after them. Launch into battle mode when the suspects refuse to cooperate, the rules in battle are simple, just deplete your opponent’s HP bar and you win. Once you have won your battles, search their bodies for the mark of the witches, clear the marks on the possessed and aim to capture their hearts as well. In this installment, you can search unpossessed girls’ bodies as well as long as you have cleared certain requirements in the game. As for mini games and unlockable stages, search for reversed colored pandas and the bunnies hidden around town, the more you catch, the more stages you can unlock.